The design for this application is for my capstone project, where my team is making an application for the airport. Our main features are a map page, flight status page, featured page, shop page, eat page, and more page. This application will allow users to always know how much time they have left until boarding, and will give the user updates based upon the flight status. This includes delays, flight changes, and cancellations. With this information, users will be empowered to leave their boarding gate and explore restaurants and shops while feeling secure that they will not miss their flight. In my capstone class, our group came up with the design for our solution after doing user research (interviews, surveys, and web research). Below are my initial sketches for the screens. I did not have the opportunity to work on the interactive design for our application, which is why I chose to work on it for this assignment. Then, I used Axure to make a rough interactive mobile prototype including the main functions. 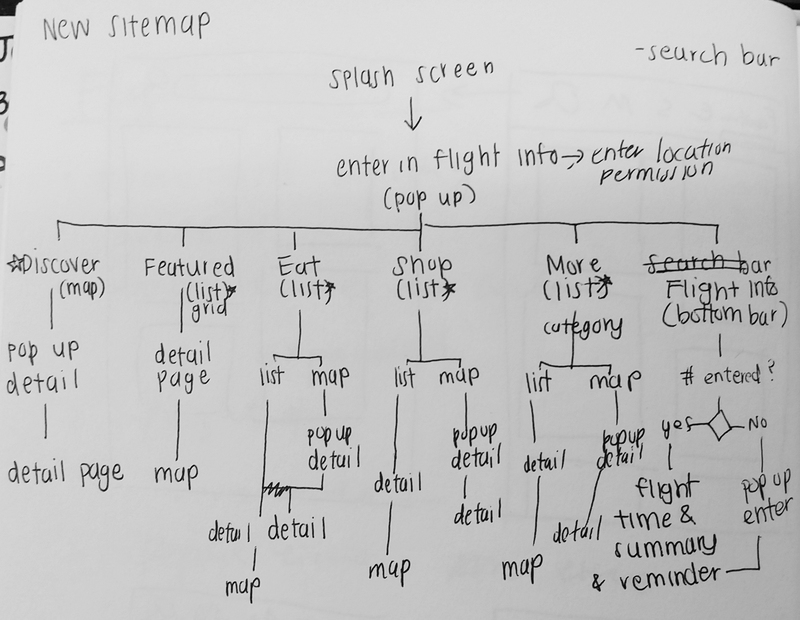 I was limited in time for this assignment so I was not able to map out the entire user interaction flow, which really hindered my testing. The participant I tested with kept trying to click every single button, which was problematic. There is still work to be done and I will be continuing to work on this, but overall, the features were valuable and it was clear what all of the elements’ purpose was. Navigation was easy and straightforward. The feedback time using Axure was not fast. For example, it took a couple of seconds to switch between the items in the menu bar. It is not as smooth and realistic as it should be. I think in continuing this work, I will switch over to Proto.io, which does a good job in making these interactions more believable. Also by using Proto.io, there will be elements for iOS that I will have immediate access to that I can add interactions to.